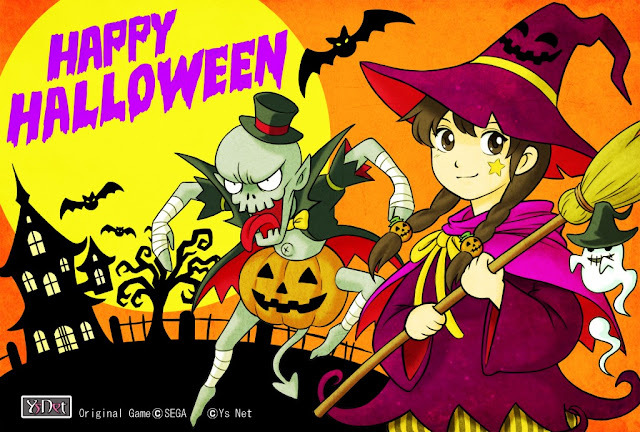 This month's Kickstarter update is Halloween themed as might be expected, with a colorful original illustration by Kenji Miyawaki. 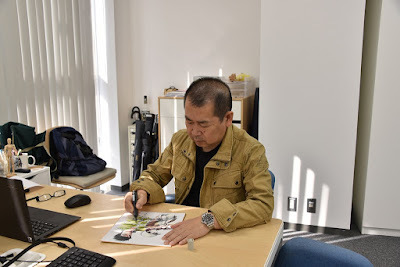 The illustration on the update page is entitled "Witch Shenhua and Pumpkin Patch Chai"
Yu Suzuki is also shown sitting somewhat self-consciously signing one of the Reward illustrations. "Let me know when you've finished taking the photo"
Kickstarter Update #61: link to official site. 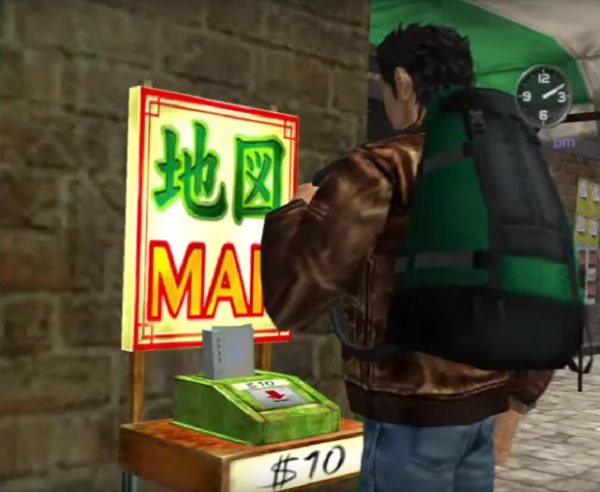 Two remarkable high-quality fan-made Shenmue videos have been released recently: "Shenmue: The Movie Remastered" and "Shenmue 3: A New Journey". 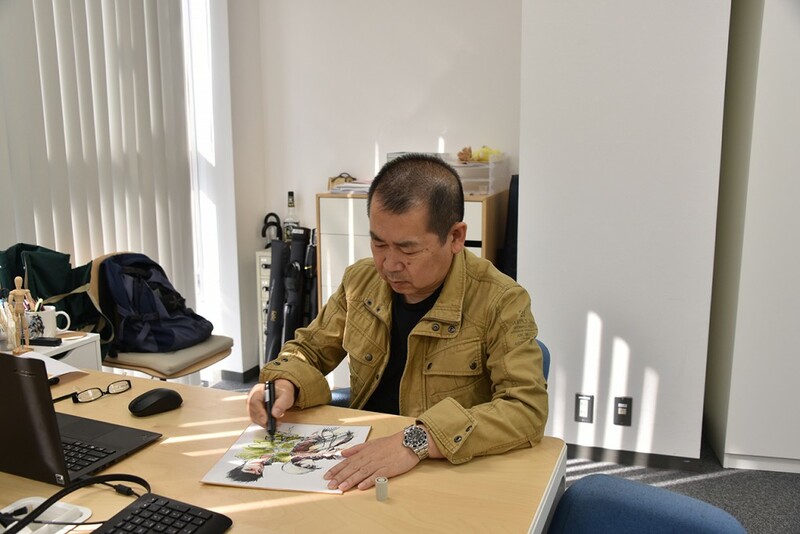 The first is an HD-quality remaster of "Shenmue: The Movie", released to YouTube by Mr .357 earlier this year. It has already garnered an impressive 21,000 views and counting. The original "Shenmue: The Movie" was an official 90-minute film consisting of a compilation of the main cut-scenes from Shenmue. The intention was to bring purchasers of Shenmue II up to speed on the events of Shenmue. 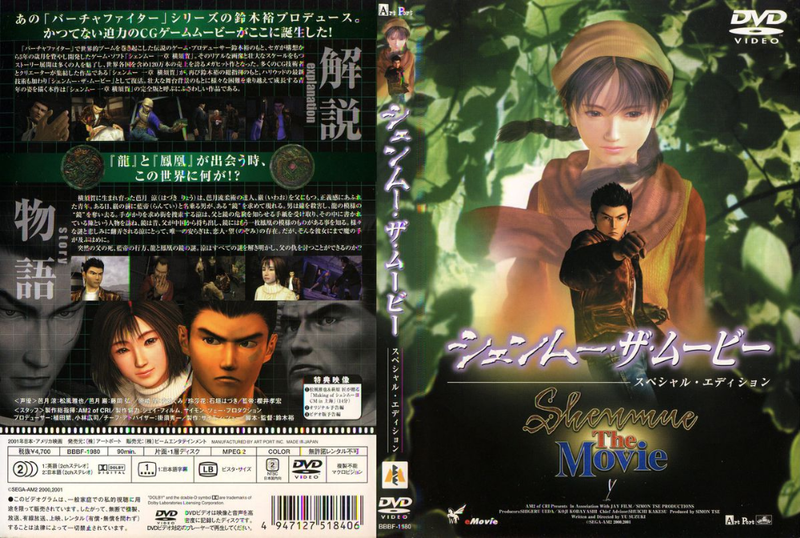 It was released as an actual movie in theaters in Japan in early 2001 and on DVD, being bundled with Shenmue II on the Xbox, a console on which the original Dreamcast-exclusive Shenmue had not been released. 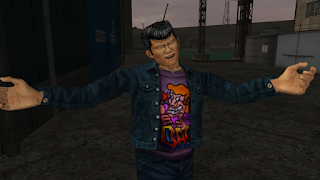 Unlike Shenmue I where Ryo is comfortable and familiar with his hometown environment, in Shenmue II Ryo is a stranger in a strange land. Fortunately he has some options available to find his way around. One of these are the handy map stands dotted around the city areas that Ryo can purchase for $10 a pop (if Ryo hasn't spent all his cash on capsule toys). Buying a map results in it being superimposed in real-time on the screen. "Buy a map... or buy capsule toys..."
"Guess I've got enough capsule toys for now." The little shrine located in Yamanose is a familiar spot for Ryo being located just a minute away from his family home. 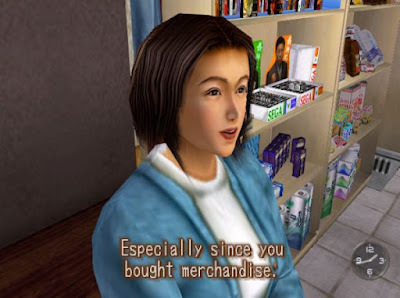 And players of Shenmue are introduced to it early on in a cut scene where Megumi shows you the kitten whose mother was run over by Lan Di and his cohorts as they sped away in their black vehicle on "that day". 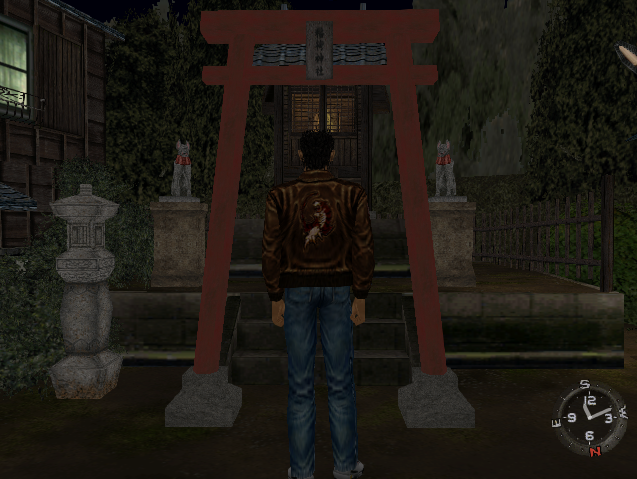 The shrine itself is a detailed example of an Inari shrine, a type of Shinto shrine found commonly through-out Japan in all sizes, from fairly small ones like in Shenmue to much larger structures. Inari (or "Inari Daimyojin" with a respectful suffix) is one of the principal deities of the Shinto religion and is the god of foxes, agriculture and industry among others. I have made some comparisons below using photos I've taken of shrines in the Yokosuka area which highlight how well the details are portrayed in the game. Today we'll dive into the real meaning behind a phrase from Shenmue I that has been quoted with affection by fans throughout the years. Like the "This..." case examined previously, it's one that can come up when Ryo shops at the Tomato Convenience Store. if used without adequate supervision. This time, Ryo selects a packet of potato chips to buy from the well-stocked shelves of the Tomato Convenience store. 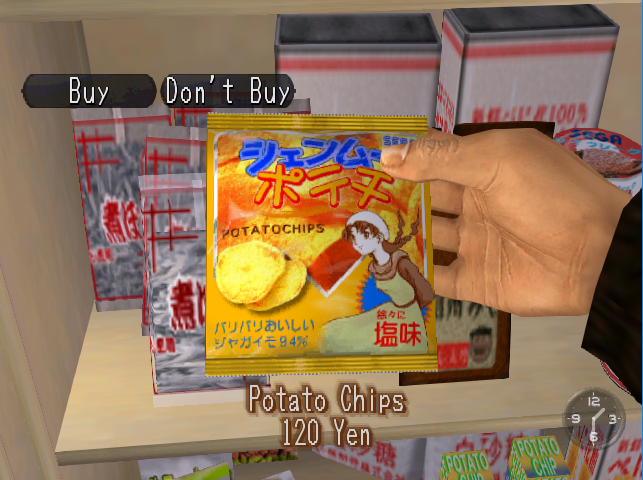 Shenmue 'Potechi' Potato Chips from SEGA. "Crispy & delicious. 94% potato. Flavor: gradually grows salty." 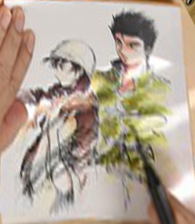 After Ryo has paid for the item, the shop assistant invites him to draw a raffle ticket. Ryo plucks one out from the box and unfolds it eagerly. 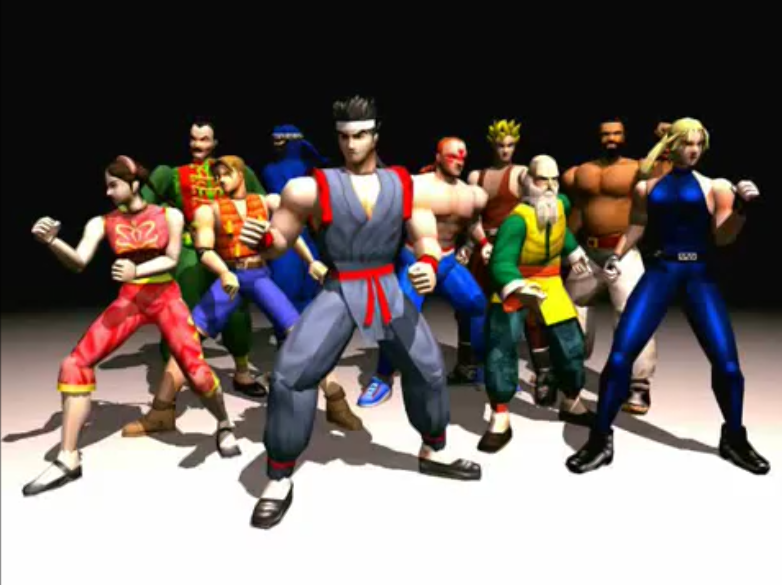 It's well-known among Shenmue fans that Ryo's character derives from the character of Akira in Virtua Fighter. 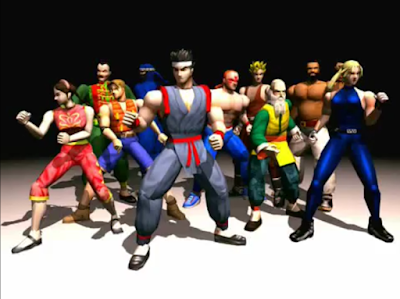 But digging among Ryo's move animations in What's Shenmue reveals just how close that relationship really is. 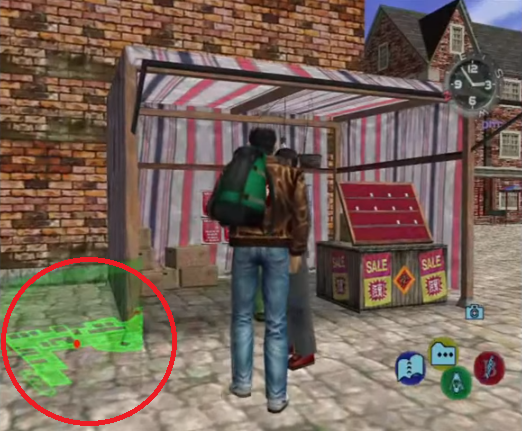 Ryo's general animations for walking, turning, crouching and so on are stored in their own motion files in the Shenmue games. While most of these are used, there are also animations that are never used in the main game. With some small change to values in memory while the game is running (in an emulator), these hidden animations can be revealed. One motion contained in What's Shenmue is named "AKI_WIN_312" and proved worthy of investigation. Today (1st October) I want along to a single-day event in Yokohama for Unreal Engine put on by Epic Games, with the venue being Pacifico Yokohama, the same conference center where Yu Suzuki held the Shenmue Premiere so many years ago. 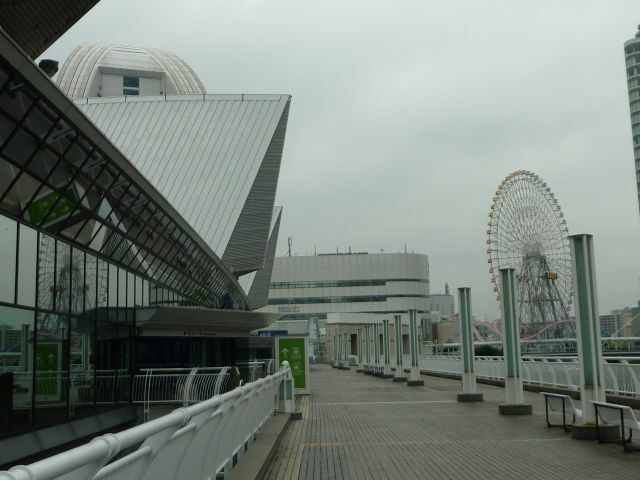 A number of talks on developing with Unreal were held through-out the day by companies such as Capcom and Square Enix, as well as exhibition booths and even a stall selling Unreal stickers and other merchandise. 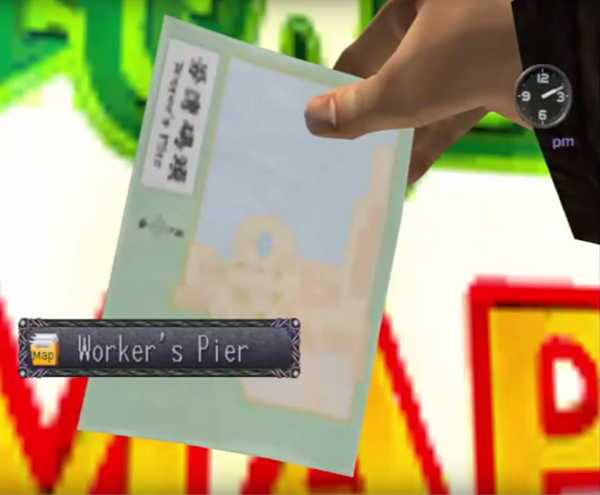 But the main reason I was there was for to get my hands on the Shenmue leaflet that the grapevine (tweet-vine?) indicated was being distributed at the event.